A nice teriyaki stir fry ! In a skillet, begin cooking chicken which has been cut into bite-size strips with enough butter so it doesn't dry up or scorch. When the chicken is almost finished cooking, add 1 teaspoon of the teriyaki sauce; let it finish cooking, stirring occasionally so it doesn't burn. Remove the cooked chicken from skillet and set aside. Slightly saute onions and mushrooms with about 2 teaspoons butter. Add chopped cabbage. In separate pot, slightly steam cut-up broccoli (do not completely cook). When cabbage is not quite done, add chicken and broccoli to the skillet of onions, mushrooms and cabbage. Add rest of teriyaki sauce and the snow peas and pepper. Simmer until everything is hot. Begin cooking rice before you have finished simmering the stir fry. 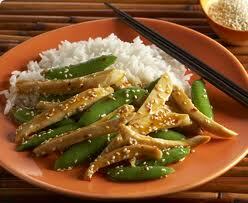 The teriyaki stir fry recipe is ready to serve...enjoy it ! !